This photo is unique - it was taken by Russian submersible MIR-2 at the point of geographical North Pole at depth 4262 m. It shows the Most Northern Species in the World - the sea anemone Bathyphellia margaritacea. Several unusual deepwater benthic communities were discovered and explored by research submarines during last decades. However, the vast arctic abyssal plain situated under the polar ice was almost totally unexplored. No direct observation of sea bottom by research submersibles were performed before in this region hidden by permanent ice. Here we report results of the first and a very risky dive of the Russian manned submersibles MIR-1 and MIR-2 at depth of 4262m under the ice of the North Pole. During this dive scientists were able to observe a benthic community never seen before. The plain muddy bottom existed in a nutrient and oxygen-deficient environment under the roof of the polar ice. Faunal composition was very poor, with inhabitants consisting of only small sea anemones and the occasional small, rapidly moving crustacean (shrimps and amphipods) that appeared within eyeshot. At the top of the food chain in this community were sea anemones Bathyphellia margaritacea that probably feed on small crustaceans. The sea anemones were small (up to several centimeters), and occurred in small groups, with about 20m between the groups and separated from each other by 1-5m within groups. The temperature at the bottom was -1.5 C. The rock formations underlying the sediment were not detected. The entire bottom at the point of the North Pole was covered by a thick layer of yellowish mud so fine that its superficial layer roiled from the slightest movement of the submersible or even just its arm. The total lack of water current prevented the fog from disappearing and made visual observations and all other submersible work very difficult. However the pilot of the MIR-2, Evgeny Cherniaev, was able to obtain detailed photographs and catch one specimen of the sea anemone with the aid of a langing-net attached to the arm of the submersible. We examined its morphology and identified this anemone as Bathyphellia margaritacea of the family Bathyphellidae. Since first being described in 1890 by Danielssen, who documented the colour of this species based on living specimens from Norwegian and Greenland Basins, no one else has seen this species alive. Videotape taken during the dive of the manned submersibles at the North Pole shows how these anemones are attached to the bottom: the foot (the base) and a part of the body are immersed into the mud and the anemones are raised above the bottom usually 2-3cm. Widely expanded tentacles form a large (5-6cm) catching surface outside of the expanded oral disk and also shelter the region of the scapulus so it is hardly possible that the scapulus plays a role in nutrition of this species. Specimens of Bathyphellia margaritacea living attached to hard substratum have a wide foot and cylindrical body which, in contraction, tapers from the base upward. In contrast, polar specimens live on the soft bottom and their bodies are broader at the top. The lower portions of the body form a thinner peduncle that ends in a disk-like enlargement (pedal disk) which is buried in the mud. This pedal disk anchors the specimen so tightly that even turbulence from the submersible does not cause them to move or shift. 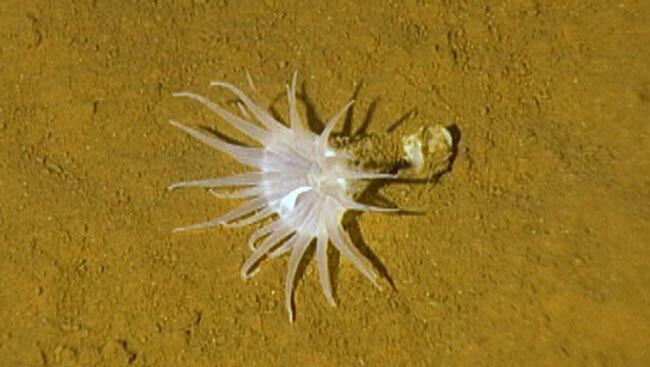 Bathyphellia margaritacea appears to be the only species of sea anemone that is able to range to the high Arctic up to the North Pole and is the only reliably identified species known from this part of the World. Sanamyan, N., E. Cherniaev, K.Sanamyan, 2009. Bathyphellia margaritacea (Cnidaria: Actiniaria): the most northern species of the world. Polar Biology, 2009, 32:1245-1250.